Welcome to the Merecat web server. This is the default landing page for new installations. Seeing this means the web server is working and the owner has not set up any pages of their own yet. Merecat started out as a pun at Mongoose, but is now useful for actual web serving purposes. 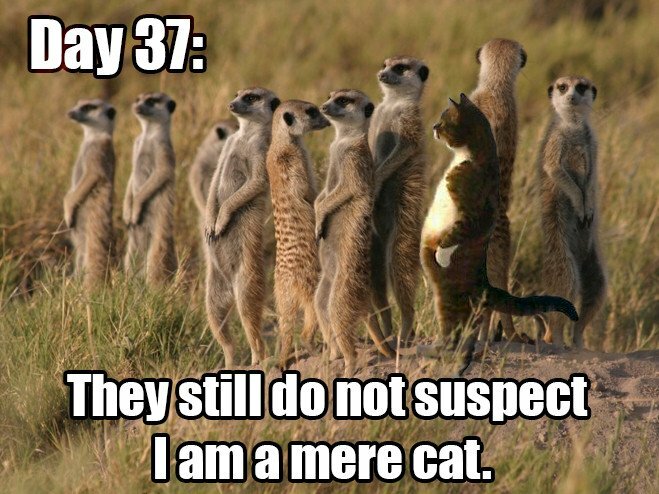 However, it is not a real Meerkat, merely another copycat, forked from thttpd. The limited feature set makes it very quick. Virtual hosts and the URL-traffic-based throttling are just about its only features. The resulting footprint makes Merecat very suitable for small and embedded systems. Jef Poskanzer for creating thttpd. Anthony G. Basile for sthttpd, and all the fixes. SunShot for the Mere Cat meme, huge props! -c CGI    CGI pattern to allow, default is "**.cgi|/cgi-bin/*"
merecat(8) for more information on virtual hosting. Then set virtual-host=true in /etc/merecat.conf. Now the web server root, here /var/www/, no longer serves files, only virtual host directories do, execpt for the shared files in icons/, cgi-bin/, and errors/. This section provides a brief overview of settings available in /etc/merecat.conf. See the merecat(8) man page for more information, in particular the throttling configuration. Shared path between virtual hosts for icons, CGI, etc. Protect every file with same .htpasswd file. Default disabled. Verify symlinks to be within chroot and/or virtual host. Default disabled. Enable check for external sites referencing material on your web server. Default disabled. Maximum number of allowed simultaneous CGI programs. Default 1. Wildcard pattern for CGI programs. The default allows executables in /cgi-bin/ and all ending with .cgi, to support index.cgi pages. Used with check-referer, see above. Specifies the number of seconds to be used in a "Cache-Control: max-age" HTTP header to be returned with all responses. An equivalent "Expires" header is also generated. The default is no Cache-Control or Expires headers, which is just fine for most sites. Set username to drop privileges to after startup. Defaults to "nobody" which usually is defined on all UNIX systems. Enable virtual hosting, disabled by default. Enable HTTPS, disabled by default. merecat httpd is free software under the 2-clause BSD license.